Last evening, my wife and I attended the Wasatch Chorale concert at the historic Provo Library. The theme of the concert was, "Something Old, Something New, Something Borrowed, Something Blue." The Something New part of the concert was a performance of the 3rd, 2nd, and 1st places winners of the Ars Nova Composition Contest that the choir sponsored last fall. My piece, After the Rain, received 1st place in the competition, so they invited me to be there. The choir did a great job with the piece and it seemed to be well-received by both the choir and the audience. I had several people approach me to tell me how much they liked the piece or how they had been affected by it. I was also approached by a local high school director who was very interested in the other piece in the set as well, "Some Rain Must Fall." 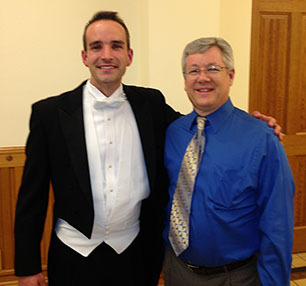 Reed Criddle is the current director of the Wasatch Chorale. He is also the director of the choral program at Utah Valley University.